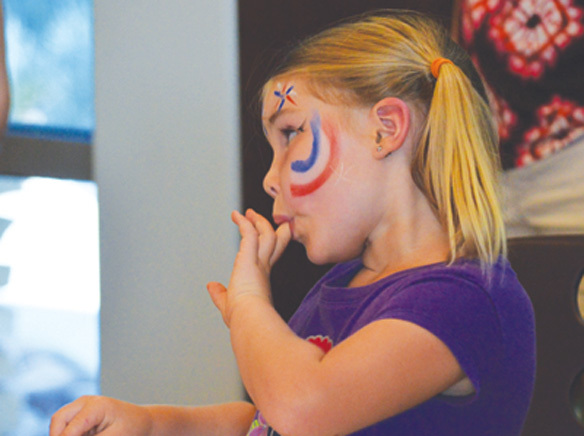 In its third year, the Rancho San Diego Branch Library held its old-fashioned Fourth of July Celebrate the USA festival on Saturday, with events for all ages in the community. Complete with a full house and parking lot. Cupcake walks, beanbag toss, cookie decorating, Reading with a Princess and a two-hour concert from Trails & Rails, performing the heritage of western music to a full house. Outside vendors offered social services for Chaldean families, Big Brothers and Big Sisters displayed its program for those in need and those wanting to help, jewelry shopping, a radio DJ, books for sale by the Friends of the Library and the Book Mobile ready for service. Senior services and homemade jams, jellies, relishes and bread met people at the door. A big hit for the kids, East County pageant representatives took turns in the Reading with a Princess event. Celebrate the USA is part of Ranch San Diego Library’s kick-off to its Summer Reading Club from age zero and up. Donna Ohr, San Diego County Library deputy director said the Rancho San Diego Branch is special to her as she was part of the team that opened up the branch. It serves more than 28,000 customers a month and checks out more than 40,000 books, music and CDs and Internet access whether by a library computer or its Wi-Fi is free to the public. Ohr said despite the recession, the San Diego libraries have kept all its doors open, something she is very proud to say. With the worst of summer heat to come, Ohr said that all San Diego County libraries are designated cool spots. To find out about library hours, the Summer Reading Club for children and adults go to www.sdcl.org.